Overtly positive, enthusiastic, vivacious, powerful, influential, beautifying, these are only a fraction of the words that describe our next Instructor, Niehla Ollie. In each lecture, Niehla constantly imparts words of wisdom, confidence and “real-world” expertise to her students. Her remarkable attitude about life and her profession as a makeup artist is sure to be contagious! Niehla received her Certification in Makeup Artistry from Columbia College. However, she holds other noteworthy degrees in, Fashion Production from the Illinois Institute of Art and Marketing from Grambling University. In addition, Niehla graduated from London Eyes International Academy of Makeup. Soon after obtaining her Certificate in Makeup Artistry, Niehla began working with makeup giant, M.A.C. Cosmetics. 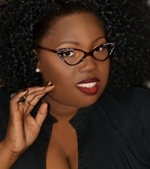 Quickly, her makeup career sky-rocketed and Niehla’s extensive work became showcased in film, where she worked in the film “Of Boys and Men“ with Angela Bassett, television, print, runway, and music videos with lead artists such as R. Kelly and Ludacris. In addition to her successes in makeup artistry, Niehla has created her own clothing line - Chocolate Sushi Couture - a unique and beautiful collection that reflects her eccentric personality and keen eye for beauty.